In February 2009, the Singapore Tourism Board licensed my company, Asia USA Realty (Singapore) asiahomes.com Pte Ltd (asiahomes), as a travel agency. 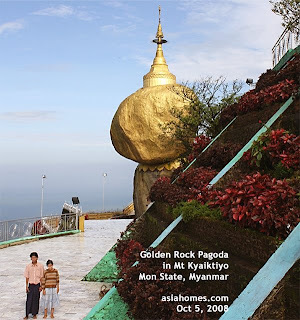 Asiahomes focuses on Myanmar tourism for Singaporeans and expatriates. Over the past 2 decades, very few Singaporeans tour Myanmar. In general, I estimate that less than 1% of Singaporeans visit Myanmar as it is a country perceived as "not safe" for tourists. Very few travel agencies in Singapore advertise Myanmar travels and tourism as they have greater demand for visits to Australia, New Zealand, Korea, China and so many countries as reflected in their Straits Times advertisements. In a small survey, one Singaporean vet's wife told me that the planes are not safe although there have been no international reports of air crashes in Myanmar in the past years. One husband of my Toa Payoh Vets cliente told me that he would never visit Myanmar because it is a dictatorship. Another of my client told me of the frequent blackouts when he visited Myanmar 10 years ago. Much has changed and the tourist hotels have generators to provide electricity during blackouts immediately in the event of a blackout. Yangon (known as Rangoon previously) is rapidly developing compared to 5 years ago and property prices have had gone up 100%. After 2 exploratory visits of at least 7 days each, in October and December 2008, I find that Myanmar is a safe place for tourists. I had a local guide and my driver as I wanted to experience more of the local culture and take pictures. A group guided tour will not permit time to enjoy the beauty of the rural areas. With custom travel, I can visit various places and stop at others without the pressure to rush to view various places of interests. In my December 2008 visit to Lake Indawgyi, my hands-on experienced bike repairer guide even helped a damsel in distress as her bike was on the verge of breaking down. While he and my driver repaired the bike, I walked around photographing the farmland on that bright and sunny morning. Myanmar is a big country of 55 million people and 8 ethnic tribes and two visits can't do justice to its variety of cultures and food. There are still many places I will like to visit. 3. Free independent Travel for a group of young people. 4. Custom Travel for small groups who wish to travel without the pressure of a fixed schedule. A tour Guide and driver, rental of car, van, mini-bus, horse or bullock carts and bicyles. Let the guide know when you want to stop the vehicle to take pictures or rest. I find this custom travel to be the most enjoyable. 5. Guided tour for small groups of families, friends, Singapore expatriates or undergraduates about to graduate. 6. Corporate incentive tours at affordable rates. 7. Luxurious tours staying at upscale hotels. Contact +65 9668-6468, 9664-0404, 6254-3326, e-mail judy@asiahomes.com, goto www.asiahomes.com for more info. Myanmar is a big country with more than 55 million people unlike Singapore with 6 million. There is an impression in Singapore that the country is not safe for tourists. Myanmar is safe for tourists nowadays. Several thousands of Buddhist pilgrims from Thailand and China visit the pagodas in this country. 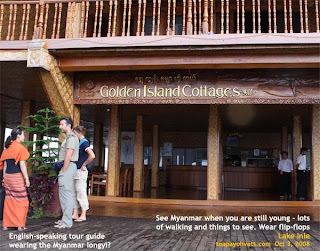 Foreign tourists are not permitted to visit certain areas like certain parts of Myitkyina. However many more areas are now open to tourism. There are so many places of interests, more than an average traveller will have time for. BAGAN Many German and French tourists visit Bagan which is a unique historical and archeological town. My stay of one night in Bagan was insufficient. It should be at least 2 nights to enjoy the history. Another 2 nights should be spent at Mount Poppa Mountain Resort which is 1-2 hour's drive away. My 5-month-old Canon Camera EOS 40 failed me as it could not focus at all. So all my pictures of Bagan are blurry. I ought to have a standby. One learnt from mistakes. At least 2 nights to de-stress. A big inland lake with clear waters and the golden sunset. Many pictures are available in this blog. YANGON Previous administrative capital. Many interesting historical areas of British colonialism to visit. Little India and China town are interesting. 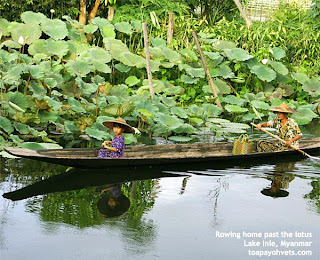 Boat rides to visit nearby villages can be arranged. The Strand Hotel is historical and excellent for your wedding dinners and/or honeymoon. Stay at least one night at The Strand. PYIN OO LWIN The British officers re-located their administrative capital to Pyin Oo Lwin to escape the hot and humid climate of Yangon during summer. Its climate is cool. Flower festival in November. It is still a garrison town and there are many places to visit. Walking in Pyin Oo Lwin is great as the air is fresh and free of congested traffic. Personalised tours for 4-8 people are best as they are more interesting. If you are the type who watch Discovery Travels documentaries from your armchair and wish to experience travel "Indiana Jones and the Temple of Doom" without danger from insurgents, you will appreciate the safety of tours into Myanmar. Your major grouse may be the uncomfortable road travel unlike the good roads in New Zealand or Australia. There will be pot-holes in the outlying roads but not all roads are bumpy. Many towns have sentry outposts to collect road toll. In conclusion, there is safety for the foreign tourists and there are no beggars pestering tourists for money. The climate is cool in October to April which is the peak tourist season. April to September is the rainy season and so is off-peak season. The hotel rates are much more affordable than those in Singapore and one may afford a stay in 5-star hotels in Myanmar's popular tourist resorts. In Singapore, the average person will not be afford to stay in a 5-star hotel like Raffles Hotel. Yet in Myanmar, the Governor's House at Pyin Oo Lwin is affordable and much more spacious and interesting than Raffles Hotel, Singapore. 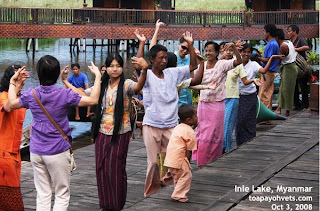 Every tourism dollar earned helps to elevate the standard of living of the ordinary Myanmarese. If you wish to do a litte to help to improve the lives of the poor farmers and villagers, visit Myanmar at least once in your life-time. And when you are able to trek and walk and walk. Kerala Tour Package- Being a leading tours and travels agency in India, we offer exclusive Kerala tour packages that include visits of most exotic place in Kerala, accommodation facility, wildlife tours, etc. Myanmar is marvellous tourist spot..